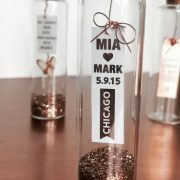 Check out these mind-blowing wedding table centerpieces that you can DIY, gift away or recycle as home decor! You’ll be glad you did! 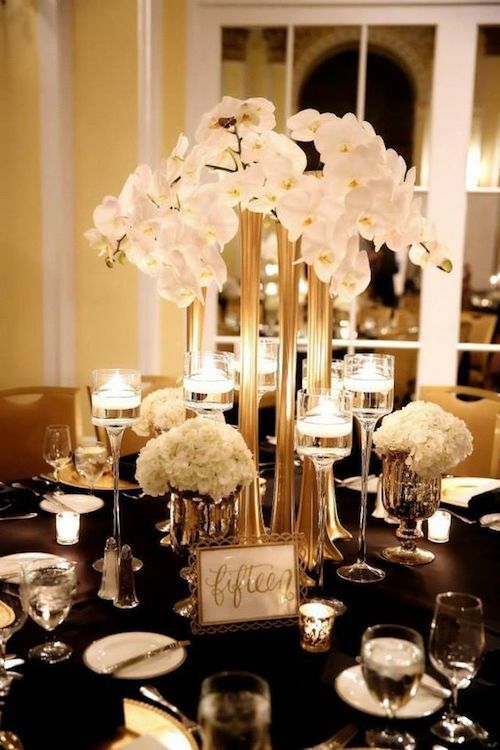 Jaw-dropping cascading crystal and orchid wedding table centerpiece. 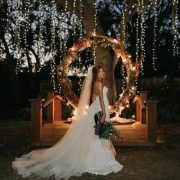 Miami indoor destination wedding planned and designed by Tiffany Cook from Unique Design Studios. We rounded up 40+ cringe-worthy wedding table centerpieces you can DIY or recycle by keeping them as future home decor! Provided you don’t have way too many tables. In that case, feel free to gift them away to your bridal squad or family. Both you friends and your finances will thank you for it. Save the moolah for the food or the entertainment! A proper wedding table setting deserves a luxurious and jaw-dropping centerpiece. Don’t you agree? 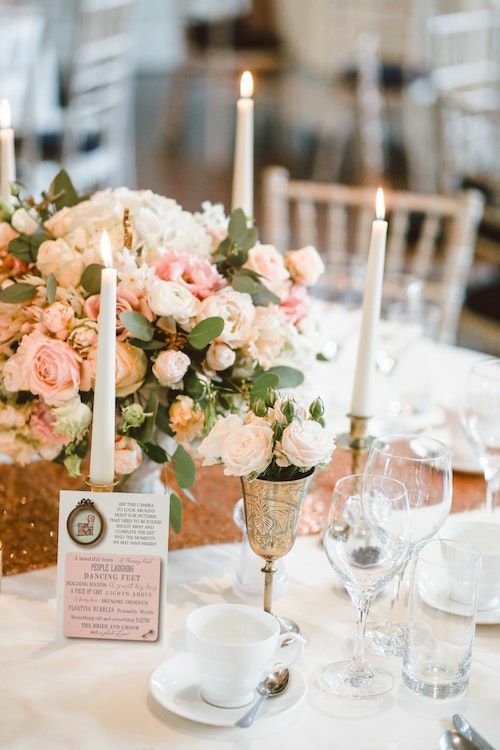 So, no matter if your wedding is held outdoors, indoors, in the cold winter months or at a sultry summery location, get inspired by these stunning wedding table centerpieces. You may even DIY some of them if you dare! 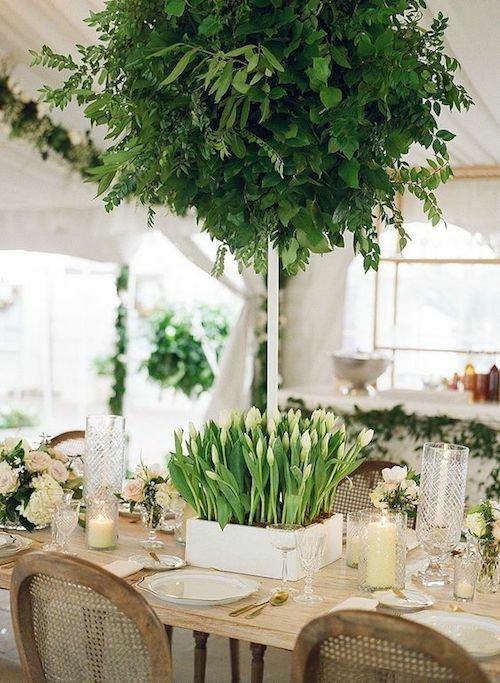 Replace the tulips with ferns and greenery for more budget-friendly wedding table centerpieces. You can liven them up with candles and crystal chandeliers. Note that the keys to success when putting this arrangement together is the natural exuberance of the plants, and its color contrast with the refined decor style of the table. Boxed tulips centerpiece. Photography: A. Bryan Photo. 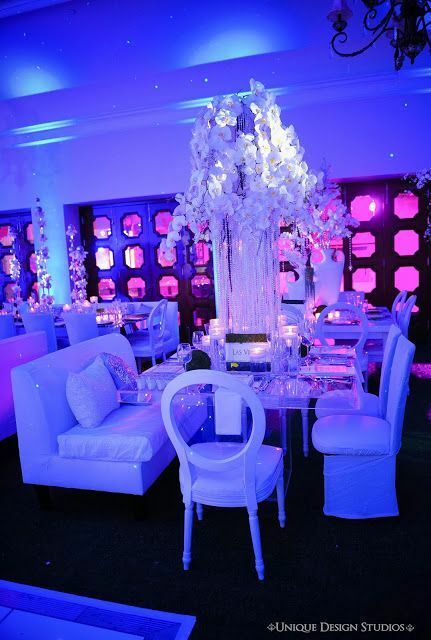 Modern Great Gatsby-styled elevated centerpiece ideas. The lull of the ocean waves, the cheeriness of the sun rays and the calm that invades you when at a beach wedding needs to be reflected in its centerpieces. 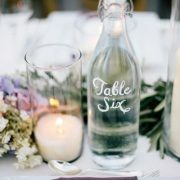 Forget those mason jars filled with sand, it’s time for more creative centerpieces! 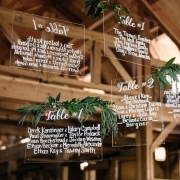 And more often than not, simple wedding reception table decorations ideas are the best. Check them out! 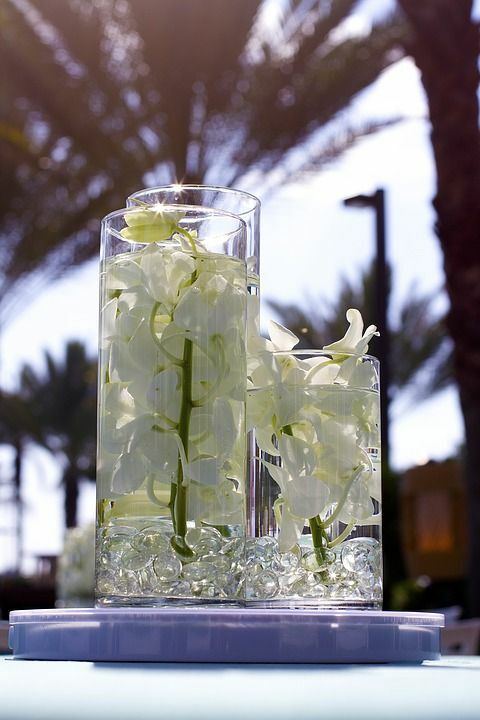 For a more affordable beach wedding centerpiece replace orchids with toad lilies. 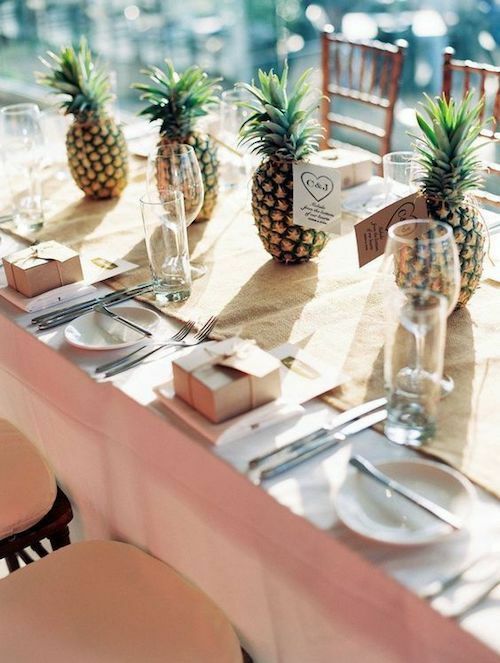 Tropical weddings deserve an original and affordable centerpiece: pineapples! Photo: Project Wedding. 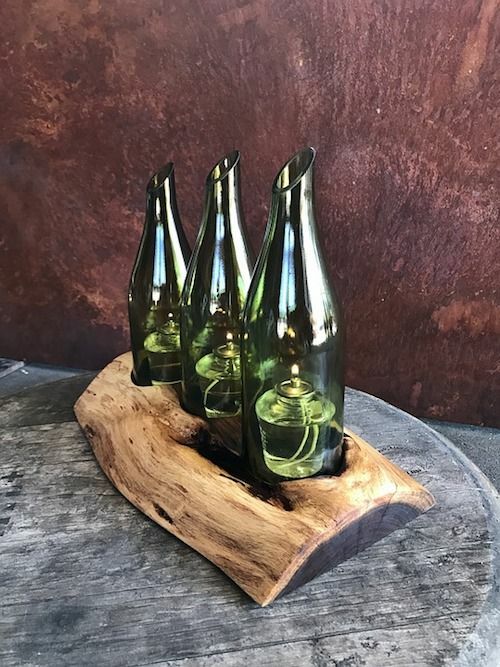 Nautical-inspired centerpiece carved in driftwood with “message in a bottle” candle holders. This is definitely a keeper to decorate your home! 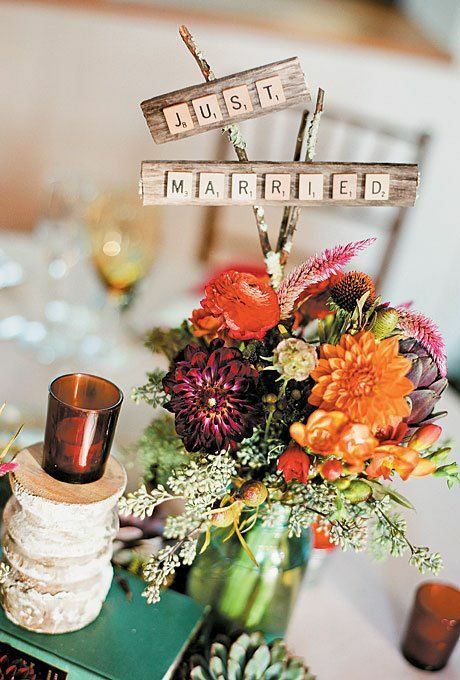 Homemade centerpieces are one of the most sought after crafts by brides. 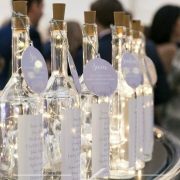 We rounded up a few DIY ideas that will look fab on your wedding tables! Dip bottles in silver paint. Before they dry, dust some glitter at the base and let them dry. Add some seasonal flowers and you have a centerpiece that will dazzle your guests. We know you’ll be taking these home! 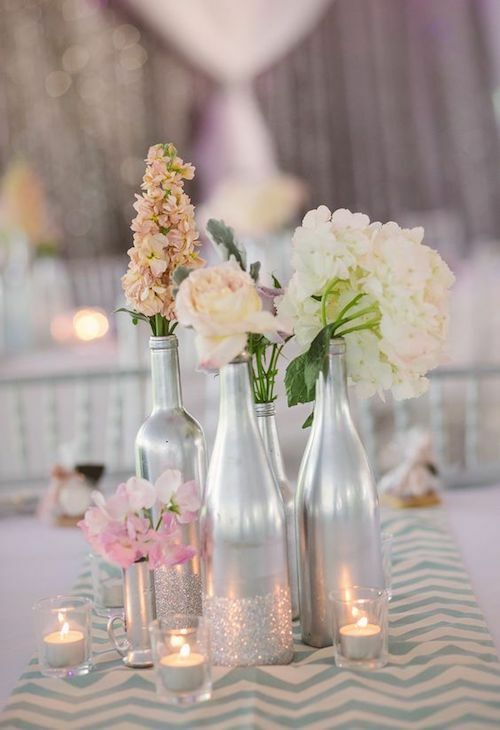 Bottles, silver paint, dust some glitter and some seasonal flowers and you have a wedding table centerpiece that will dazzle your guests! 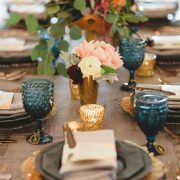 Ecological and easy to DIY these wedding table centerpieces will be the center of attention – not just the table. You will need some candles, asparagus, artichokes, green beans and ribbons. 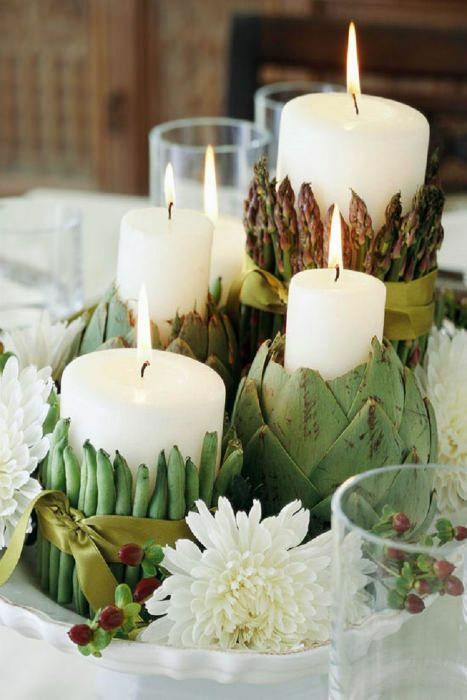 Remove the meat or heart of the artichokes and place the candle in the middle. Be careful not to push the petals too far apart. Ecological and easy to DIY, these wedding table centerpieces will be the center of attention – not just the table. 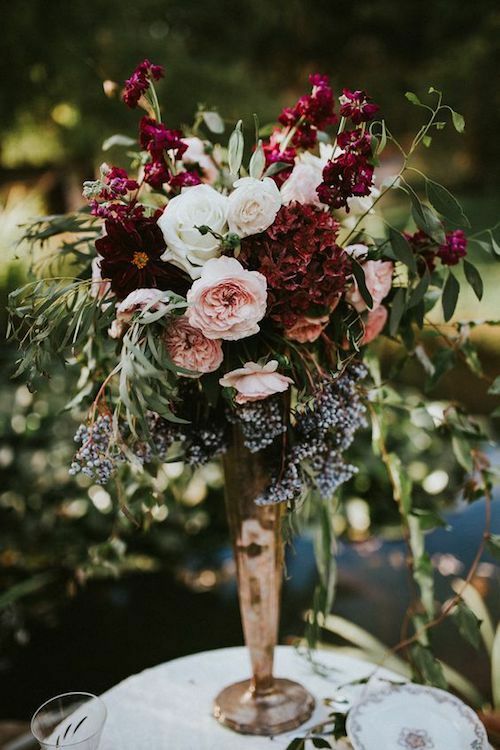 To make this glorious floral centerpiece you will need English roses, Scabiosas, cherry vanilla scoop, burgundy dahlias, garnets and shrubbery. Place them all in a tall vintage floral vase. Budget-friendly decor does not necessarily mean you need to skimp on looks. You can purchase some geometric cardboard boxes and wrap them with shimmery paper or cover them in glitter. Surround a simple centerpiece with votives, Place a mirror under the clear floral vase or grow your own succulent pots and plants! 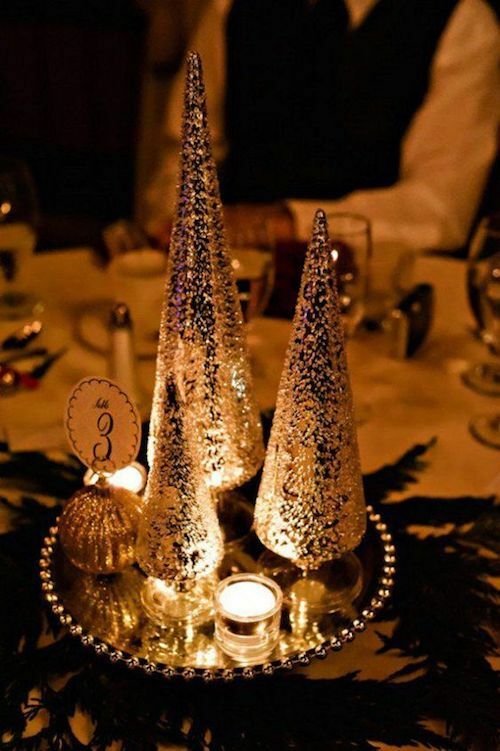 Glittery paper cones for a glam winter wedding centerpiece. Quirky centerpiece for game lovers.